Jennifer Baszile is an entrepreneur, writer and professional speaker who brings a wealth of knowledge and a proven track record of achievement to her marketing and coaching business. She earned a BA from Columbia University and an MA and Ph.D. in American history from Princeton University where she received many major prizes for her research. At 30, Jennifer became an award-winning assistant history professor at Yale University where she taught for eight years before she entered the world of free enterprise. 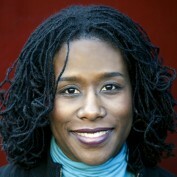 Jennifer is a nationally recognized author who scored a six-figure book deal with Simon & Schuster on her first project. Her book, The Black Girl Next Door: A Memoir, was released in 2009. It was favorably reviewed in The New York Times, The Los Angeles Times, USA Today and numerous other newspapers and magazines. Jennifer is a dynamic professional speaker who has spoken at Goggle, Simon & Schuster, White & Case, LLP, exceptional schools and universities including UCLA and University of Connecticut. Jennifer has been featured on television and has appeared on countless radio programs across America.